This is a great appetizer for those guests who like those spicier dishes. When you grill a jalapeno they tend to become spicier, so taking out the seeds and stuffing the center with cream cheese will neutralize this grilled treat so most people can still enjoy them. Wrapping them with bacon adds another dimension of grilled flavor that will also help to calm down the spiciness of the jalapeno peppers. The bacon is an optional ingredient to this recipe but most people think this enhances the flavor. Start by taking your cream cheese out of the refrigerator so it has time to soften and become more pliable. Take a knife and run a cut vertically along the side of the jalapenos. Use your fingers to remove all of the seeds from the center of the jalapenos. This will make room for your cream cheese filling. Stuff your jalapenos completely full with the cream cheese. Cut your bacon slices in half and wrap a slice of bacon around each jalapeno appetizer. Use tooth picks to secure your bacon around the outside of the jalapeno pepper. 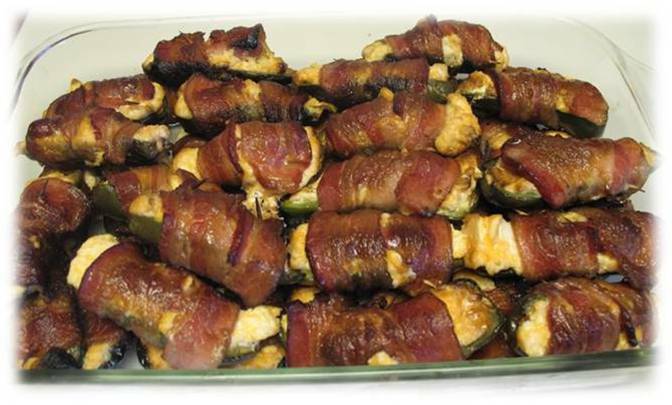 Fire up your grill and place the bacon wrapped and cream cheese stuffed jalapenos right over the flame. You will know when to flip the jalapenos when the bacon is cooked to your liking. Typical cooking time for your jalapeno pepper appetizers will take about 4-5 minutes on each side.